NEWTOWN, PA – In honor of a long-standing relationship with the Trenton Thunder and their beloved golden retrievers, Newtown Veterinary Hospital unveiled an exam room dedicated to the team and their pups on Tuesday, January 28. 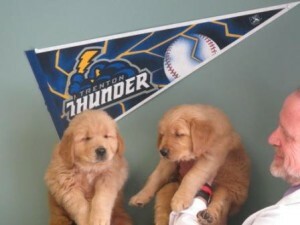 As the official veterinarian of the Trenton Thunder, Newtown Veterinary Hospital has enjoyed years of caring for Chase and Derby, the popular bat dogs for the team. The opening of the Trenton Thunder Room marks the first wellness visit for the team’s newest dog generation. Derby’s two puppies, one male and one female, were born December 15, 2013. The male, who will eventually assume Bat Dog duties at ARM & HAMMER Park, will be named following a “Name The Puppy” contest at www.trentonthunder.com. The new Trenton Thunder room is more than just Newtown Veterinary Hospital’s way of welcoming the puppies into their family of patients. Decorated with memorabilia and photos, the room pays particular homage to Chase, the much-loved first generation bat dog for the Trenton Thunder, who lost his battle with cancer last July. Fans may remember seeing Chase (That Golden Thunder) fetch bats and carry water for his human teammates while his son Derby followed behind. The loss of Chase was hard-felt by all who knew him, and particularly the doctors of Newtown Veterinary Hospital, who treated him throughout his fight against cancer. Now Derby, Chase’s son, is the official bat dog of the Thunder and Newtown Veterinary Hospital looks forward to a continued friendship with him and the Trenton Thunder. With the birth of his puppies, Derby will soon have a new friend and apprentice, and the legacy of Chase will continue to live on. The Trenton Thunder room, now officially open for use, will act as an ever-growing scrapbook for the dogs and celebrate the memory of Chase and the traditions he began.